An American church group planning to do humanitarian work in Cuba got no farther than the Havana airport. (CNN) -- The brief detention in Havana, Cuba, last week of a Portland, Oregon, church group comes on the heels of the detention of an American contractor and could indicate an increasingly chilly reception for some American visitors, according to the church travelers. The December 26 trip for 14 members of the First Unitarian Church of Portland is a reminder of the entrenched tensions between Cuba and the United States despite the Obama administration's loosening of previous restrictions. The church group was traveling on a U.S.-issued license and planned to do humanitarian work. The group was denied entry to Cuba. Part of the group spent the night detained inside the Havana airport before being put on a plane to Mexico, the church's social justice minister, the Rev. Kate Lore, told CNN. The church made three trips in November without incident, but things went sour almost immediately after the 14 volunteers exited the plane in December, one of the participants, Jacquie Jones, told CNN. Most of the group passed through customs without a problem, but five members of the group were stopped and had their passports and licenses checked, Jones said. Jones said she told the Cuban officials, "We love the Cubans. We have many friends here; there is no reason to keep us out of the country." 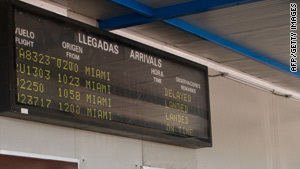 The Cuban authorities told the five that they were not allowed inside Cuba because they were there for religious reasons and forced them to wait for almost an hour and a half before putting them on a commercial flight back to Mexico, from where they had traveled. Jones pointed out the U.S. gives travel permits to Cuba for religious work, but the island, at least in this case, rejected the group for the same reason. "It's a total Catch-22," she said. The reason for the brusque treatment is likely because of the detention of another American earlier this month, several church members said. I truly believe something has to be done to normalize relations. The detained man, whose name has not been released, is a subcontractor for Development Alternatives Inc., an international development group on contract with the U.S. government to promote human rights in Cuba. Cuban leader Raul Castro said that the man was detained because he was distributing satellite communications equipment in order to destabilize Cuba. For nearly a half a century, the United States has maintained a trade embargo against Cuba that many on the island nation have blamed for their country's woes. "I don't blame the Cuban government, or our government, but I truly believe something has to be done to normalize relations," Jones said. The nine others who had already passed through customs faced additional questioning and were detained inside the airport overnight, Carol Slegers, who was part of that group, told CNN. Later, it was learned that Cuban authorities considered imprisoning them, she said. Instead, they were left to find a place to sleep on the floor of the airport. The group ended up sleeping underneath a staircase, using fabric they brought for the clothes-making project as sheets, Slegers said. The next morning, they were put on a plane to Mexico. The Cuban officials "were rude and cold and indifferent," Slegers said. "It was very psychologically disarming." But, Slegers and others made clear, they were not mistreated by the Cubans. "We're upset because of the treatment, but ultimately, we want the policy to change," she said. "I hope goodwill and improvement of relations will come out of this incident, moving the two countries beyond the my-belt-is-bigger-than-your-belt diplomacy of the last half century."